Shelco Industrial Stainless Multi-Cavity Bag Filter Housing. The Shelco BFS Series stainless steel fluid / water filter bag housings can accomodate flow rates of 350 - 1050 GPM. 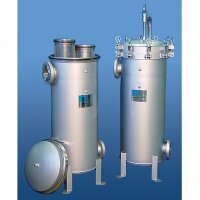 This stainless steel filter is designed for industrial and commercial filtration needs. 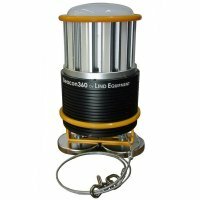 This liquid filter is extremely rugged and capable of 150 psi @ 300F. The unit is manufactured by Shelco Filters Middletown, Ct. Made in the U.S.A. Bag change is easy as the unit is equipped with a band clamp or swing bolt closure and drain ports. Housing is constructed of 304L stainless steel. Shelco model 2BFS-2C- 350 GPM (clamp closure) selection requires two #2 bags. Inlet / oulet 3 inch flanged. Shelco model 2BFS-2SB- 350 GPM (swing bolt) selection requires two #2 bags. Inlet / oulet 3 inch flanged. Shelco model 3BFS-2SB - 525 GPM (swing bolt) selection requires three #2 bags. Inlet / oulet 4 inch flanged. Shelco model 4BFS-2SB - 700 GPM (swing bolt) selection requires four #2 bags. Inlet / oulet 4 inch flanged. Shelco model 5BFS-2SB - 875 GPM (swing bolt) selection requires five #2 bags. Inlet / oulet 4 inch flanged. Shelco model 6BFS-2SB - 1050 GPM (swing bolt) selection requires six #2 bags. Inlet / oulet 6 inch flanged. Contact us directly if your application requires other configuration options such as high temperature viton gasket, etc. 877-553-3698.